What’s the craziest pizza you’ve ever had? Leave a comment. This isn’t so much of a recipe… it’s an idea. A very naughty, indulgent, crazy, yummy idea. A great use of leftovers (which is how this recipe -err- idea was born!) 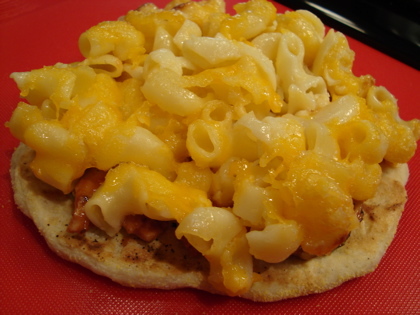 or you can go all out with my Easy Pizza Dough Recipe and Macaroni and Cheese Recipe (which is where my leftovers came from). Sounds crazy, I know. But crazy-good! Prepare pizza dough. Do this ahead of time to allow the dough to proof. Get the complete step-by-step recipe here. 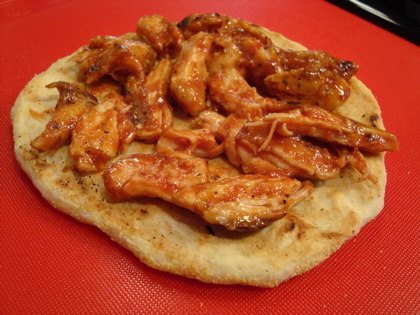 You can also do a quickie version by using pita bread or flat bread for crust. Heck, you can even use bread! 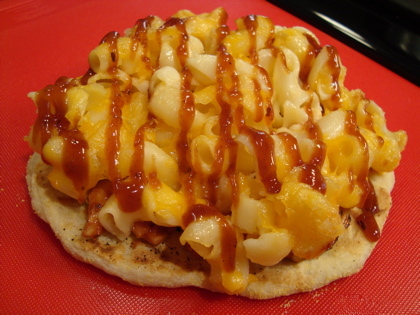 As a matter of fact, some inspiration for this crazy pizza was the Grilled Cheese Invitational where a team made a barbecued pork-mac-n-cheese-grilled cheese. UPDATE: That team has become the Grilled Cheese Truck rolling the streets of Los Angeles! Brilliant! 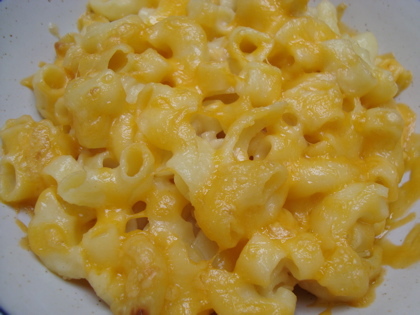 Prepare Macaroni and Cheese. 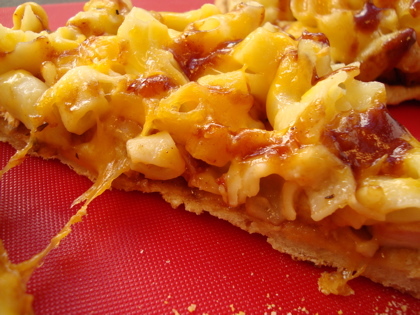 Though I normally make my Mac a little more “crusty” on top, I opted for a more cheesy, less crusty version for the pizza. Gooey, baby. Get the complete step-by-step recipe here. Prepare chicken. It can be grilled or baked. Leftover or fresh. Add cooked chicken to a mixing bowl and shred. 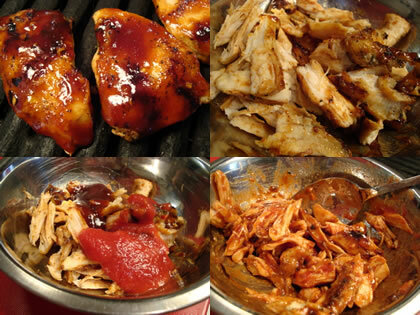 Add tomato sauce and BBQ sauce to taste. Stir. Let’s get good n’ crazy! As you may have guessed, I am a sucker for the grilled pizza. 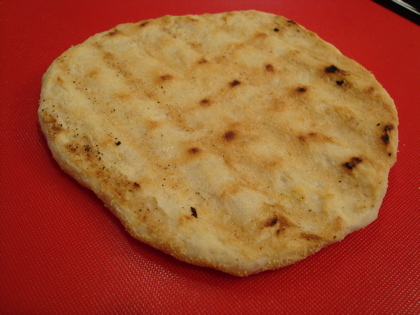 Grill top side of pizza crust or pita/flat bread. Layer on some Macaroni n’ Cheese. 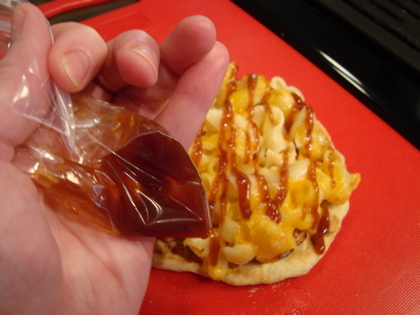 Fill a plastic bag with BBQ sauce and snip the tip. Or heck, you can spoon it on too if you’re not trying to look all fancy on your blog like me. 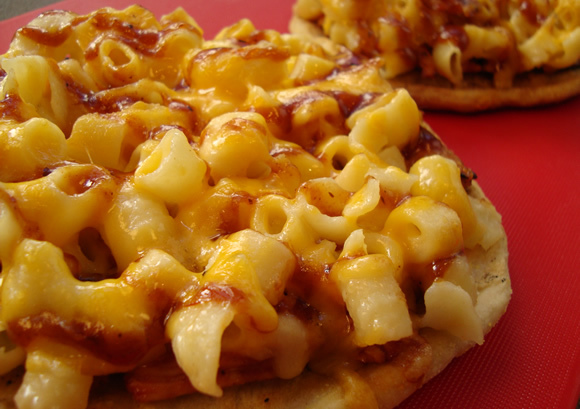 Drizzle, squeeze or somehow apply a bit more BBQ sauce to the top of the macaroni. 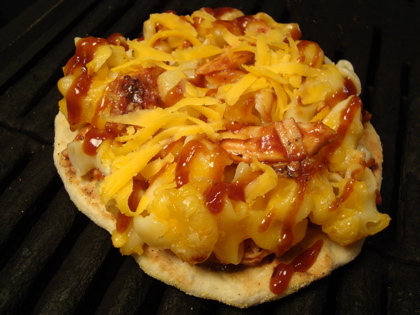 Top with a little more shredded cheese, if desired, and grill over medium/medium-high heat until cheese is melted and toppings are heated through. TIP: You can use a grill pan or skillet. You can also bake on a preheated, 450(F) cookie sheet or pizza stone in a preheated oven (450F) for 5-10 minutes. 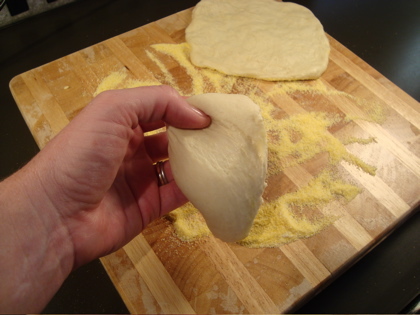 If using the Easy Pizza Dough Recipe, please consult other helpful tips for grilling and oven baking on the recipe page. 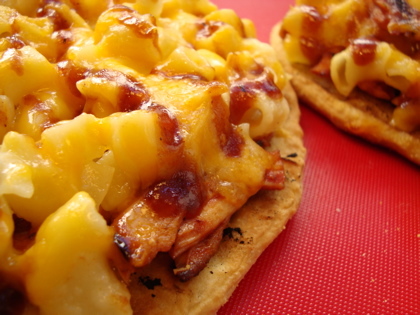 Layers of cheesy comfort and tangy barbecued chicken. Oh yeah. Crazy, crazy good! Link to the Oh No You Didn’t! blog post. I adore every type of single pizzas like this one that it is, alone, a complete yummy meal!! Oh naw! My son would eat this up in a flash! Looks like great football fare for this weekend. Geaux Tigers! I love crazy…and I love this recipe! 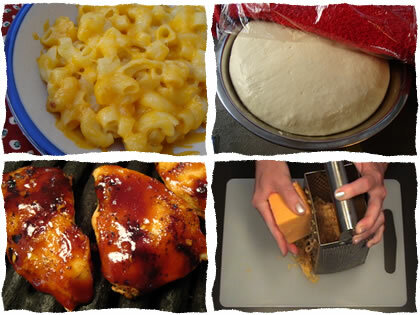 My girlfriend loves bbq chicken and mac n cheese — so I will be making this for her soon. Gera, Haha! It is a meal in itself!! Pizza with bananas is one I’ve never heard of – but I’d give it a try! The best football fare, Chef Ryan! Thank you!! Hey Chef Tom, Thanks for dropping by my site – I’d love to know what your girlfriend thinks of the pizza! Mmm, what a great combo! Creative and delicious. Oh oh oh…this looks so good! woow, I love the recipe, I’ll add this in my menu, would you mind if I copy your recipe.Thanks for sharing such a delicious recipe. It’s a comfort food extravaganza! Looks soooo good!